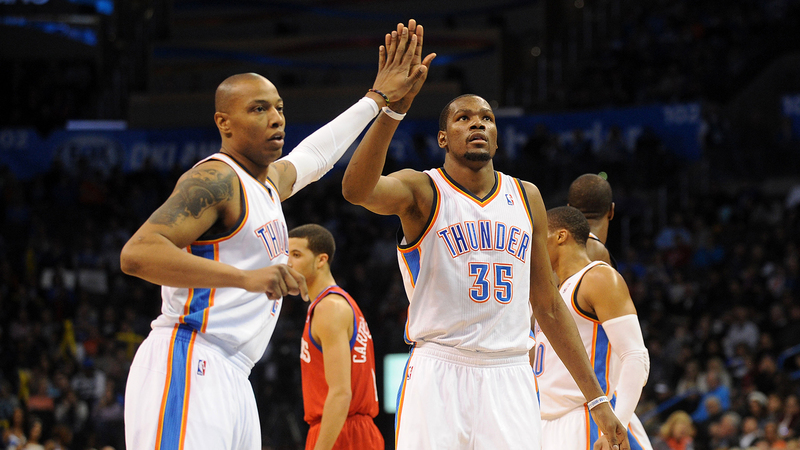 OKLAHOMA CITY – Caron Butler got in early and played plenty. Tuesday night, against the 76ers, it was the kind of game that set up perfectly in a situation that was also pretty close to ideal for the newest member of the Thunder. A chance for Butler to play against a bottom-of-the-league kind of team. An opportunity to get some minutes, learn the offense in what was as close to a no-pressure setup as possible. Instead Butler sat most of the fourth quarter, as did Kevin Durant and Russell Westbrook. But instead of talking about Butler, his experience, what he’ll ultimately bring to the Thunder and his game, this 125-92 victory was Russell Westbrook at his best and Kevin Durant doing MVP kind of things. Couldn’t have gone better for Westbrook. Couldn’t have been smoother for Durant and it couldn’t have been an easier transition for Butler. "Well, I haven’t won in about a month," Butler joked. "It feels great to get a win." That part was easy. This game was good right up until about tipoff. The 76ers came in 15-45 and left losers of 15 in a row. Meanwhile, Westbrook was so good, so quick. He had eight assists in the first half of the first quarter, finished with a career-best 14 assists and had a triple-double wrapped up with 4:55 to go in the third quarter. He played just 20:17, the second-fastest triple-double in NBA history. "He’s a special player," Brooks said after Westbrook’s eighth-career triple-double. "Plays the right way. Give him credit. He plays hard." No need to give Westbrook credit. He’s earned it, and on a night where Butler was the story coming in and Durant played the leading role, as always â this time scoring 42 points on 14-of-20 shooting, Westbrook’s game is on the rise. "It’s crazy," Westbrook said. "I’m just trying to get my groove back. Blessed to be able to do that in such a short amount of time." Westbrook played poorly and sluggishly in losses to Miami and then against the Clippers, his first two games after the All-Star break, but he’s been better in each of the past three. Tuesday was his best, and his triple-double was his second in his past seven games played. Westbrook finished with 13 points on four-of-nine shooting, had 10 rebounds and the 14 assists. "Guys were open," Westbrook said of his assists. "My job was to give them the ball. I just play off my instincts. I never come in looking to shoot first, pass first, rebound first." The performances by Durant and Westbrook certainly took the attention away from Butler, who was signed by the Thunder Saturday and went through his first practice Monday. Butler entered the game about 7 minutes into the first quarter to a loud and hearty ovation. He scored two points on one-of-four shooting, had five rebounds and an assist. "The thing I liked was he played basketball the right way," Brooks said of Butler. "We have to continue to add that mentality to our team. If he had a shot he took it. If he had to pass, he passed it.I liked what I saw. He’s going to get more comfortable with what we do." Butler’s arrival in Oklahoma City comes just a week after Kendrick Perkins was declared out for the next six weeks with a groin injury and just days after Thabo Sefolosha injured a calf that will cause him to miss the next four weeks. "I was just trying to find my spots," Butler said. "To find spots, play off Russ, Kevin and those guys. I"m finding out where opportunity is at. Butler’s arrival also comes as the Thunder have put some space between what was an ugly three-game losing streak after the All-Star break. Now OKC has won three in a row and in the near future Butler will see more time and get more shots, but he won’t have to do near as much if this trend of Durant and Westbrook dominating continues. "They’re talented," 76ers coach Brett Brown said. "Kevin ended up being Kevin. He (Russell) is so gifted." As for Butler? Well, we’ll learn more about him in the near future.